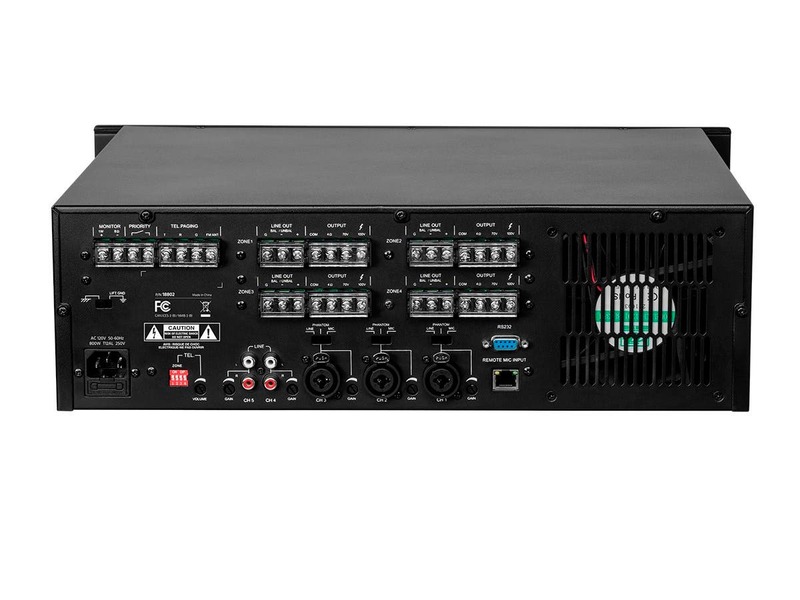 Have purchsed this amplifier to use in a 70V system primarily got Background Music. All speakers connected and working fine. The issue is the volume levels. The USB /Mp3 player have full volume.. but I cannot get any volume when using the mic inputs (Channels 1 & 2) and only minimal volume when using the line level RCA inputs (Chnl 4 & 5) from external stereo music source on Channels 4 & 5. I did try a mic pre-amp ahead of the mic input (channel 1 ) to boost the mic level and was able to get the amplifier to work properly with the adequate ducking of signal when sensing mic 1 source material. I should not have to do this though.. I am using dynamic mics (not requiring 48v) and have tested the mics and cables on other equipment. As for the RCA line inputs.. I have to turn both the source channel (Input #4) and the Zone Levels (Zone 1-4) to max level (all the way) get any sort of volume output to the speakers and it is still very low . In comparison I only have to turn the Zone Levels to #2 level to get similar audio output from the USB input source... I am sure my wiring is a good and I have not overlooked some obvious selection on the front panel push buttons. I have many years as an audio engineer and have exhausted my ideas as to what may be wrong bother than the 4 zone amplifier may not be fully functional. Looking for assistance please? BEST ANSWER: Using the remote control turn the USB module down to about 6-7. 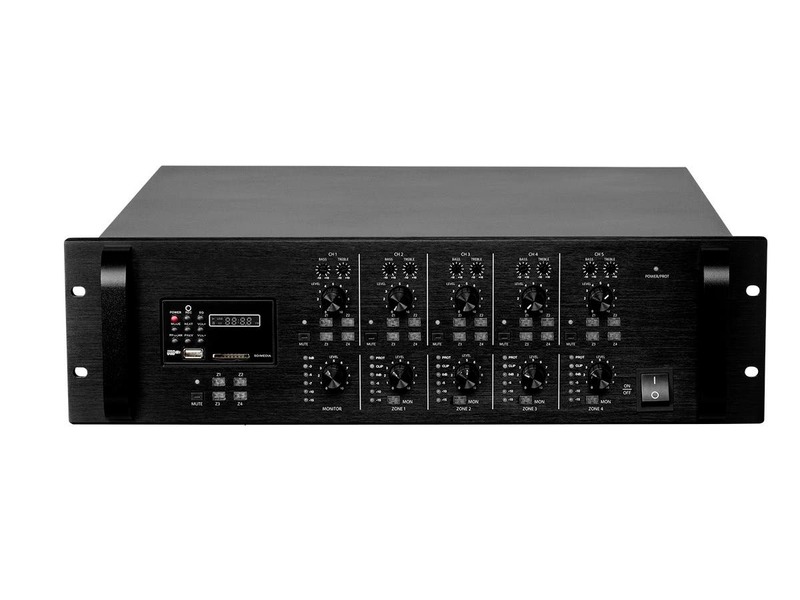 The 3 XLR and 2 DUal RCA inputs all have independent Gain Controls on the back. Try turning them up to about 75-80% full. Adjust if you hear distortion. The gains are set pretty low from our factory to prevent less experienced users from blowing up speakers. Be sure XLR switches on back are set to MIC if you do not require phantom power. If you continue to have trouble please contact Tech support. I have this amplifier and using for similar reasons. Mine is working fine. I use a tablet for streaming music and a microphone occasionally that does require 48v. The only thing i had to do was adjust the gain on the back next to the inputs. I get tons of signal and have to be conscious to keep it out of the red. Sounds like you know what you are doing. Possibly a bad amp? There’s a small gain adjustment by the mic inputs on the back. This should help. There are some gains on the back of the amp. You can adjust with a flat head. Is there any cheap way to adjust the volume remotely? BEST ANSWER: Thank you for your interest in this commercial amplifier. The matrix amp does have RS232 control. Please refer to the downloadable User's Manual for all necessary codes. You can also use one of our in-wall volume controllers when used in 8Ω mode. How many of Product # 13684 can be wired in parallel and/or in series per channel? BEST ANSWER: It depends upon how many Ohms in total you are trying to accomplish. Identical speakers in series (similar to Christmas tree lights) add up with each speaker sharing the applied power. The other method of parallel connection of speakers lowers the total resistance as seen by the driving amplifier - a far more dangerous and damaging type of connection if too many are connected in parallel improperly draws excessive current from the amplifier. This would be the best application for a 'speaker selector/impedance matching" device. Those have 'transformers' that 'upscale' each speaker's impedance so that the driving amplifier is not overloaded. The downside of those devices is the labor and wiring necessary to bring each speaker's cables back to one location - a lot of attic work! I need to run as many as 8 speakers per zone. How do I make that happen? I just want to confirm 4 speakers can be wired to each zone(or 2 speakers per channel). Each zone has a 4ohms, 70v, or 100v wiring option. 4 of these Alpha speakers wired in parallel would be 2ohms of total impedance, which to much for the 4ohms label. I don't see a connection for both left and right channels on each zones output, so I don't understand your prior answer of "2 left 2 right per channel". Just on the input do I see left and right options. If I understand it correctly, both the left and the right channels are combined on the output. How should I connect 4 of these speakers on a zone when the label says 4ohms is the impedance? In parallel? which terminal, 4ohms, 70v, 100v? Channel 1 seems to override the other channels. If I have a mic in channel 1 for example it will cut out everything in the other channels. Same happens if I have music in channel 1. Anything sending a signal will mute 2 3 and 4. Any ideas as to why, or how to fix it? BEST ANSWER: Channel 1 has Priority. This is to allow announcements and emergency instructions to override background sounds. If you are not using the Telephone Paging input you can close the priority circuit. Just insert a small cable between the 2 Priority connections on the back of the unit. I have this amp. I use my mic in channel 1 and my music in channel 5. I believe channel 1 incorporates 'ducking' which means when there is signal present it takes priority and mutes or lowers the volume of other channels. It works well for us because we are using it as background music and the mic as an announcement only situation. I would suggest not using channel one for anything if you just need it to be a multi-channel amp with several inputs. I am looking to power 14 speakers in a restaurant. 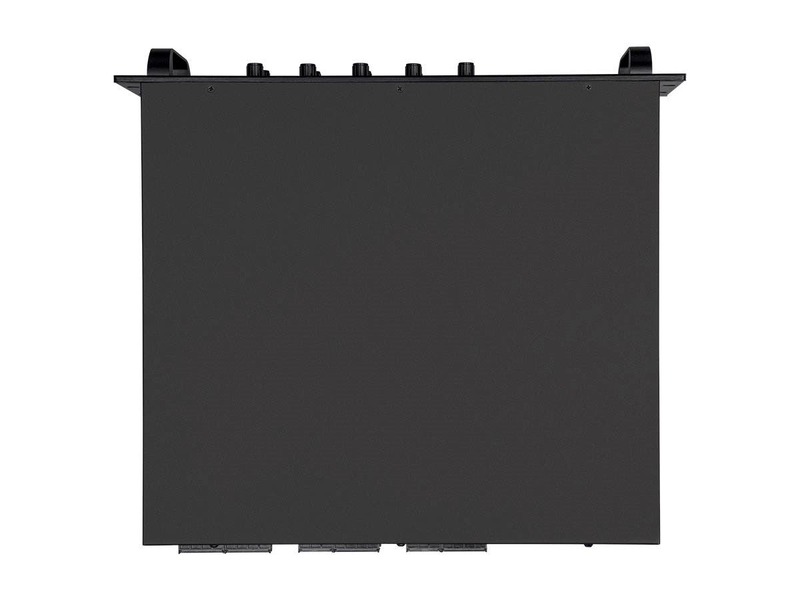 Would this power 14 of the 8" ceiling speaks also sold here at Monoprice? BEST ANSWER: Thank you for your question. You would be able to use the 15699 speakers, however, you would have to wire the speakers in parallel but you would only be able to have a total of 8 speakers. If you wished to use the 18802 amplifier, it would be best to go the route of utilizing it as a Constant Voltage system. Which would require speakers like Product # 14887. Do Need to use the satellite speakers? Can I just use the sub with my 70v system? Can I use 4 of these subs with your 4x120w mixer/amp and also use the 6.5" 70v speakers? will all these components work together? BEST ANSWER: You do not need to use the satellites. You can use with additional 6.5" speakers. Just run them all parallel. do not use the sub outputs as they are only 8Ω outs. Can this simultaneously playback 4 different mp3 files, one per zone? BEST ANSWER: Thank you for your interest in this commercial audio amp. No, the internal mp3 player can only play one file at a time. how many sets of the bgm 4.1 speakers can i run with this amp in 70v mode? BEST ANSWER: Thank you for your interest in our commercial audio products. 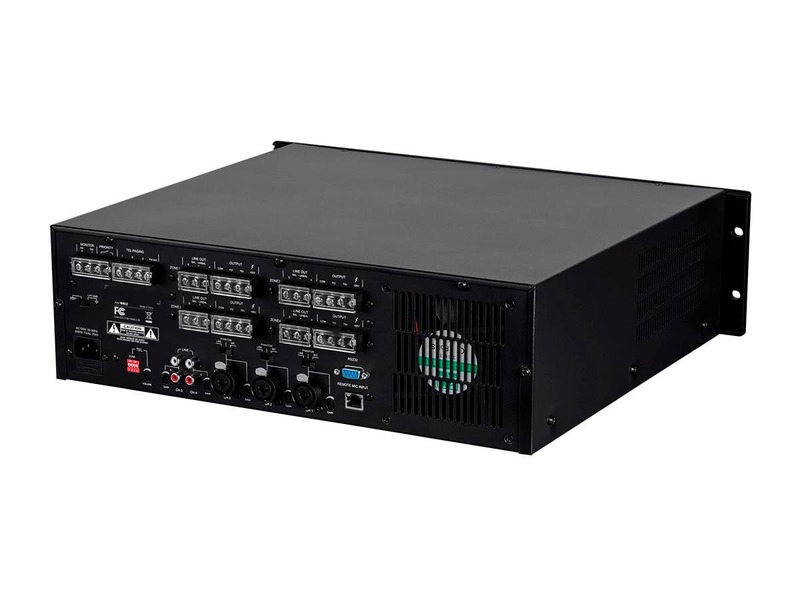 The 4x120 amp is advised to run 70V load to 96W max per output channel (x4). The BGM system has 60W and 30W taps with 70V operation. 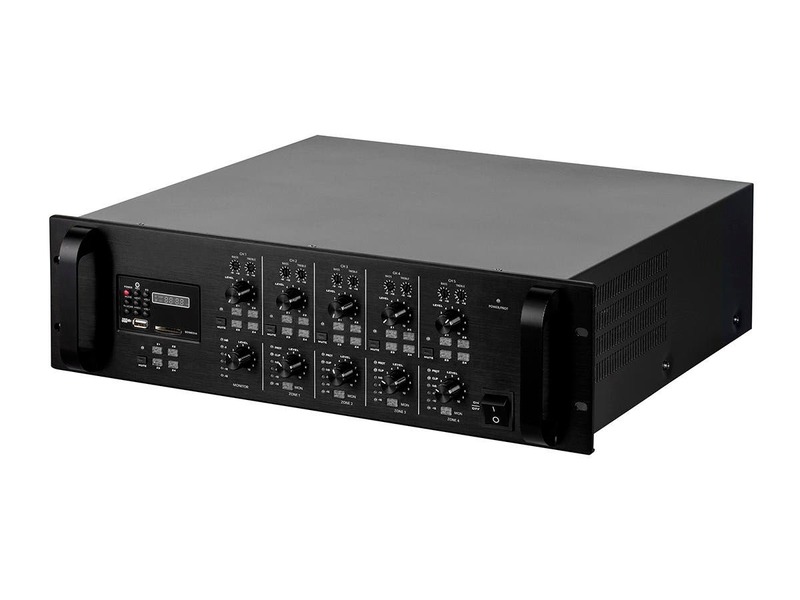 You can safely run 1 @ 60W and 1 @ 30W per output channel for a total of 8 BGM systems. You can run all BGM @ 30W and power 12 total systems. Can you connect an iPhone or iPad to the USB port for audio playback via Spotify, Pandora, etc.? If so, will it also charge the connected device? Thanks. Installed the first one and discovered there is a considerable amount of white noise when no audio is present. The second one shot sparks out of the side and tripped the breaker when we plugged it in. Third one is in route. Don't know what it will do.